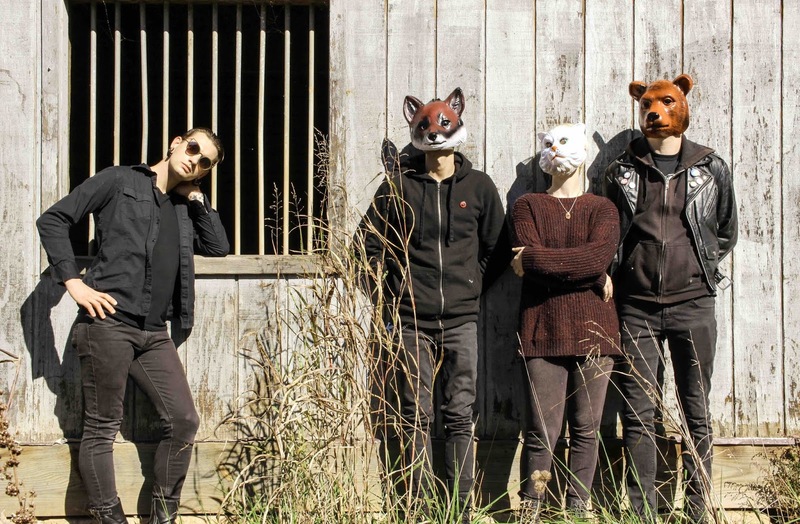 Crooked Ghost is a four piece band from North Carolina. Had I been allowed to take a guess, my take would have been British. This band certainly found its musical mustard in the U.K. of the 80s. As anyone could and can listen to this music, it can pop up anywhere in the world. And it does. 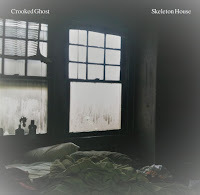 On Skeleton House Crooked Ghost plays with the darker 80s. That unhappy times for youngsters, who only later found out what a glorious youth they (could've) had. The dark sounds, despondent vocals, even Joe Strummer's tribal call from 'London Calling' is in here, twice. It is all not unlike the album cover. An unmade bed, dirty sheets and windows. Like any youth, looking after the back end of life not to forget appearances is not a main priority. Some stick in there, most become regular citizens with responsibilities, etc. 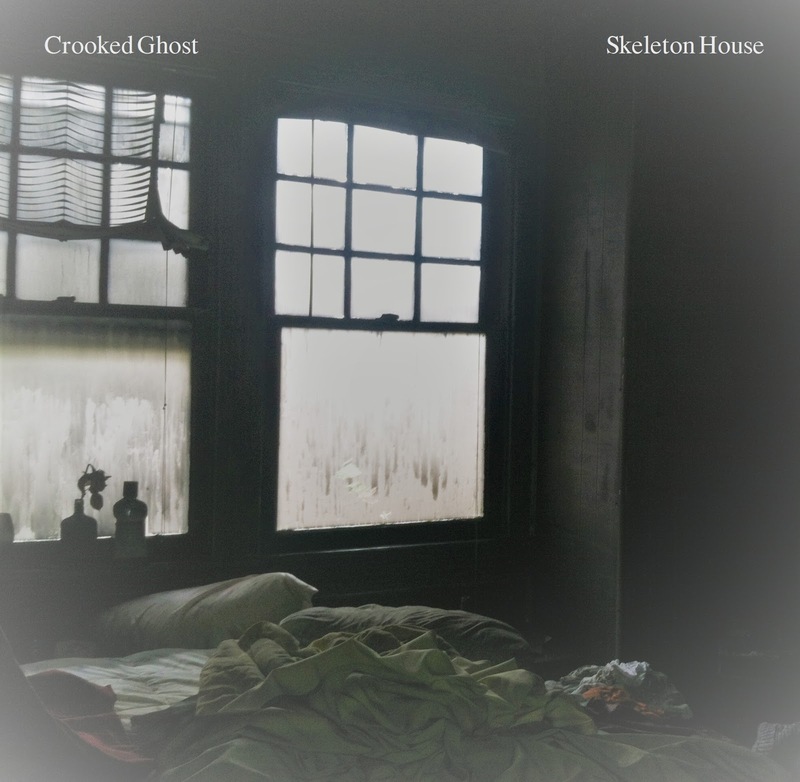 Crooked Ghost manages to present a consistent atmosphere on Skeleton House that moves between a few central elements. The music holds the heavy handedness Simple Minds had, the singing holds elements of Marc Almond and Morrissey in the meandering singing of Ray Clark. Traces of new wave from the early 80s can be found as well. An important question is, do I like the music on this album? Well, it started so intriguing. 'Body In Stars' is this slow moving song. The guitar playing a pattern in two chords over and over. The voice sort of hovers over the music. As if an incantation, spell-binding the listener to hang on for the remaining seven songs. 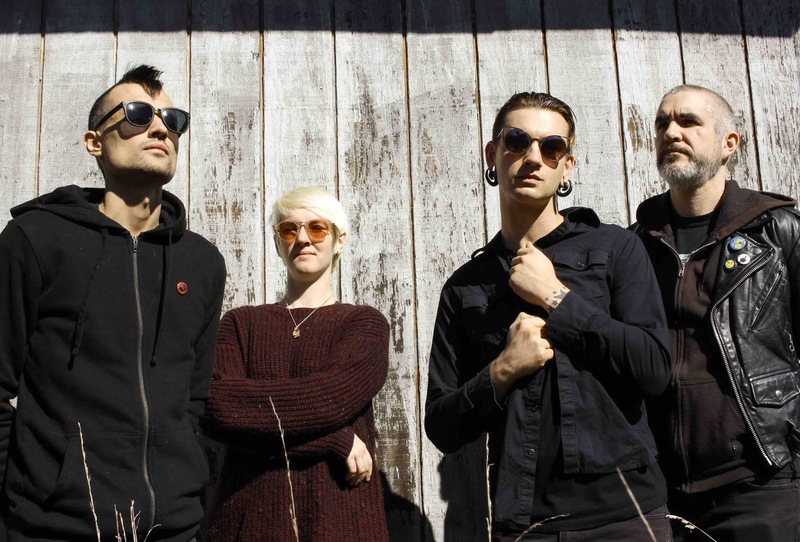 With eight songs Skeleton House is a short album, following 2017's 'Strange Burial Rituals'. When Crooked Ghosts kicks up the tempo with 'Sleepwalker' the spell works. A fierce rhythm is kept up over which a guitar totally comes alive. The singing is meandering. Long held notes and words, yes, like Morrissey used to sing in The Smiths. I will stop using references here. There are so many more. The question what Crooked Ghosts actually wants to achieve or who it wants to be is a justified one. In fact during the album the spell wears rather thin in the end because of it. That does not mean Skeleton House is a bad album, far from. The band manages to lay down the 80s atmosphere in a very convincing way, while the songs all have their moments of interest. Melodically there are no complaints, really. You will find that diversity is taken care of and in a positive way to. Even within songs the band can kick up a storm from nothing really. 'Catch Fire' just goes up and up, from the light-hearted dab-da-da, the band slowly works itself into a state, twice. I find that I can listen to this album effortlessly. There's one thing missing: a real winning song. Like Simple Minds had 'Alive And Kicking', R.E.M. 'The One I Love' or The Smiths 'Bigmouth Strikes Again' and The Cure 'A Forest'. O.k., we are talking the absolute top of the 80s here, but it is a song like that Crooked Ghosts needs to stick out, in front of everybody else. For the rest, Skeleton House is an album every lover of 80s music should acquaint him or herself with. Fun is the wrong word where the early 80s were concerned, but yes, Skeleton House does offer it in its own way.